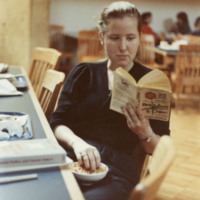 An unidentified student is pictured with a bowl of cereal in her lap. She has her fingers in the bowl while reading a book. Several other books are also visible on the table.